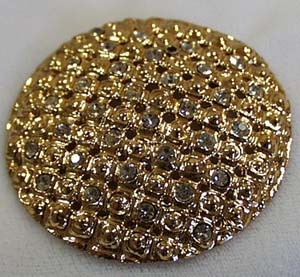 Brooch Goldtone Clear Crystals Round This is a round goldtone brooch with clear crystals. A lovely piece of costume jewelry. Lots and lots of glitter on this one. I counted 32 crystals. In a nice quality goldtone base metal. Would look great on a suit, hat or add to your favorite purse! Would really dress up any piece of your wardrobe. Possibilities!!! In mint condition, probably from the 1970's. Measures 2 1/4" across. Items Similar To "Brooch Goldtone Clear Crystals Round"